This isn't just another app. IT'S YOU. LEADING THE WAY. The first public affairs app on the App Store, opening the doors of Congress to everyone. Available on iOS and Android. Learn who is working for and leading the Trump Administration with this app that includes cabinet and staff. Available on iOS. Learn who is leading the state governments around the nation. Returning soon to iOS. Contact members and staffers working for the Oklahoma state legislature. Available on iOS. We have partnered with Dods, UK to bring the UK and EU parliaments to mobile. Available on iOS and Android. New for the 116th Congress for our Professional and Enterprise editions is a free companion Apple Watch app. From the watch face complication you can take all 541 members with you as well as your bookmarks and local membership. Call, check the Twitter timeline, dictate, scribble, or take a note. Get the DC office address and mapped directions, political information, and a short bio. Tap on the small photo and get it full-screen. In Settings, you can set the highlighting color to reflect your party or to just match your watch band. Connecting you to Capitol Hill, your way. All of our data is available for one-time use and through yearly subscriptions. We create easy-to-download Microsoft Excel files based on our live databases. If you would like more information about options customized for your needs, please send us an email. Your group, office, or campaign. We are also available to design and deploy custom government and poltiical applications to fit your needs. We bring our award-winning techniques to develop living apps that grow over time as the needs of your constituency change. Contact us here. "Top iPhone App for Washington"
"Congress is an iPhone Fav"
"It's quick, easy, and essential"
"I can't recommend it enough"
"Innovator Award for Political Engagement"
You as an individual citizen are why we made our mobile applications. For far too long, information on members of the government have been relegated to expensive, out-of-date, and wasteful printed books offered to the few. Our vision was to give you the power to contact them on your time without spending hundreds of dollars. We hope you take advantage of the opportunity. Professional and citizen journalists are another group that uses our apps all the time. Generally out in the field, these clients need information fast and out of the office. We have many from all kinds of media including ABC News, Congressional Quarterly, CNN, FOX News, Huffington Post, National Journal, New York TImes, POLITICO, RedState, as well as the Washington Post. Large and small companies, law firms, and government relations pros also find it useful to have our information on the go. We have dozens of clients including Apple, Boeing, Booz Allen Hamilton, Coca-Cola, Delta Airlines, Deloitte, ExxonMobil, General Electric, GEICO, Hogan and Harston, Intel, Lowe's, McDonald's, Microsoft, Olgivy Government Relations, Pfizer, Target, UPS, and Verizon. Associations and interest-groups find our apps more cost-effecitve to purchase than large, bulky printed books that are only updated quarterly. Association clients include, AFL-CIO, American Bar Association, Americans for Tax Reform, MoveOn.org, National Air Traffic Controllers Association, National Federation of Independent Business, National Urban League, and the United States Chamber of Commerce. 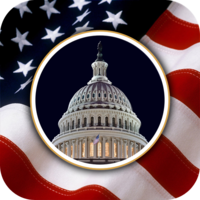 Government officials and candidates use our apps to get to know each other and keep in contact while they are out of the Capitol or on the campaign trail. We have a running list of current and former members as well as their office staff (we keep their names confidential) on our Facebook page. Our firm offers discounts for Capitol Hill offices as well as large groups. For more information, email us here. Michael is focused on providing a greater voice in government and improving the companies that serve us. He is an expert in public opinion research, beginning his career with The Gallup Poll. A developer of mobile apps for over a decade, he is the chief architect of the apps we design. Mike earned his Ph.D., M.A. and B.S. degrees in Political Science and Mass Communication at the University of Florida. He lives in Northern Virginia, just outside D.C.
Sean was working on mobile devices before they could text, have ringtones, or search the web. He is an expert in mobile computing and is the Lead Mobile Partner Engineer for Twitter, where he helps developers from around the world leverage Twitter in their applications. He is responsible for every line of code we produce. Sean holds an M.S. in Computer Science and a B.S. in Software Engineering, both from Auburn University. He lives in San Francisco.